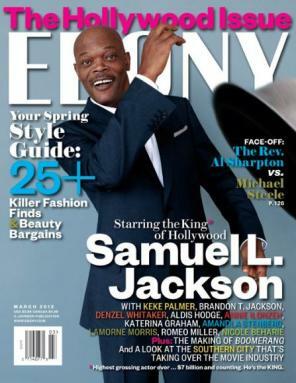 Samuel L. Jackson only voted for President Barack Obama because of the color of his skin, the Hollywood actor revealed in a profanity-laced interview in the March issue of Ebony magazine. “I voted for Barack because he was black. ’Cuz that’s why other folks vote for other people — because they look like them,” Jackson said. "That’s American politics, pure and simple. [Obama’s] message didn’t mean sh-t to me. In the end, he’s a politician. I just hoped he would do some of what he said he was gonna do. According to the New York Post, the "Pulp Fiction" legend repeatedly dropped the N-word during his cover story interview. “When it comes down to it, they wouldn’t have elected a [bleep]," Jackson said. "Because, what’s a [bleep]? A [bleep] is scary. Obama ain’t scary at all. [Bleeps] don’t have beers at the White House. [Bleeps] don’t let some white dude, while you in the middle of a speech, call [him] a liar" -- an apparent reference to Rep. Joe Wilson's "You lie!" outburst during Obama's health care address to a joint session of Congress in 2009. Defending his repeated use of the racial epithet, Jackson said it "became a part of my vocabulary when I was born." "Because it was used on me in my house, often . . . I know the word [bleep] as an admonishment, an endearment, a criticism and an invective. So I use it; I don’t run from it. I don’t have an issue with it or who says it. I always put it in the context of how it was used on me," he said. Jackson previously made political headlines in October, when he agreed with fellow actor Morgan Freeman's assessment that the Tea Party was "racist."